South Park Season 16 Episode 5: "Butterballs"
Stan: Dude, did a bully take your lunch money again week? Stan: That's the third day in a row, you gotta tell a teacher. 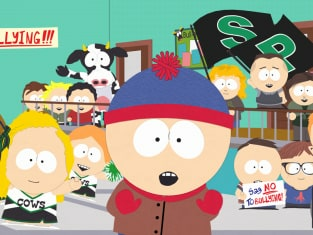 Butters: Nah, I'm not a tattle-tale. Stan: Then write the principal an anonymous letter. Butters: Nah, I'm not an Anonymous Andy. Clyde: So just get a bigger bully to beat the bully up. Butters: Nah, I don't want kids calling me kids calling me a cliche conflict resolution Kevin. No no no, I'm telling you guys, music videos have devolved to nothing but pretty girls, wearing skintight clothes, singing about their vajayjay. Used to be chicks talking about relationships, now it's all my vajayjay this, my vajayjay that. But clearly that's what sells.